Award-winning author Jennifer J. Stewart writes seriously funny books for children, including If That Breathes Fire, We're Toast , which made VOYA's Best Fantasies of the Year List when it debuted; The Girl Who Has Everything; the multiple-state-award nominated Close Encounters of a Third-World Kind; and the Glyph Award-winning picture book The Twelve Days of Christmas in Arizona. When Jennifer is not writing or speaking in schools or at conferences, she volunteers with MAKE WAY FOR BOOKS, a non-profit organization which gives young children the chance to fall in love with books and reading. Visit Jennifer on-line at www.jenniferjstewart.com. Award-winning author Jennifer J. Stewart writes seriously funny books for children, including "If That Breathes Fire, We're Toast!," which made VOYA's Best Fantasies of the Year List, the multiple-state-award nominated "Close Encounters of a Third-World Kind," and the Glyph Award-winning picture book "The Twelve Days of Christmas in Arizona," which was illustrated by NYT bestselling artist Lynne Avril. 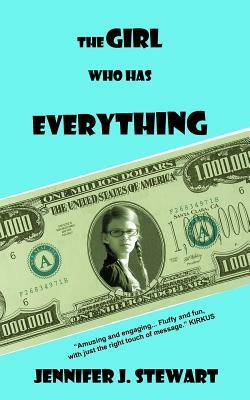 Like her heroine, Phoebe, in "The Girl Who Has Everything," Jennifer has always enjoyed orphan books. When Jennifer is not writing, or speaking in schools or at writing conferences, she volunteers with MAKE WAY FOR BOOKS, a non-profit organization which gives young children in Southern Arizona the chance to fall in love with books and reading. Visit her on-line at www.jenniferjstewart.com.